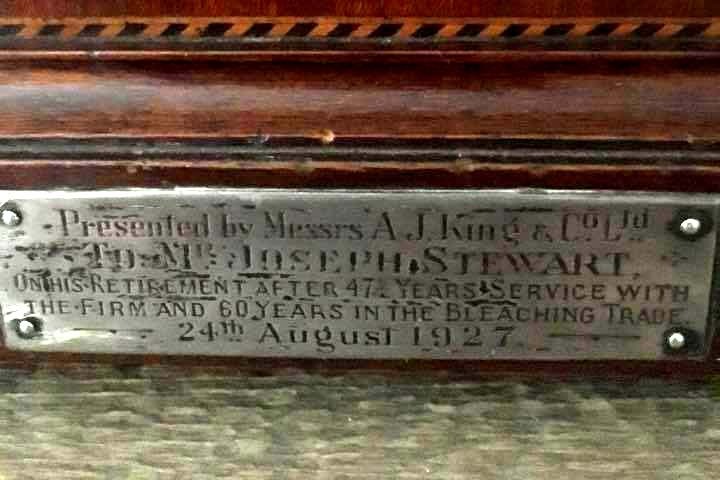 JOSEPH STEWART was born in Chorley, Lancashire, in 1853, the youngest of nine children. 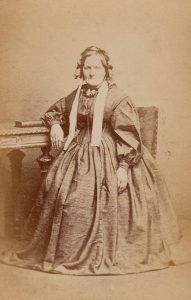 His father was James Stewart (1807-1865) and mother Ann Whittle (1806-1864) (pictured right, click on photo to enlarge). Ann was born in Wheelton, Lancashire. 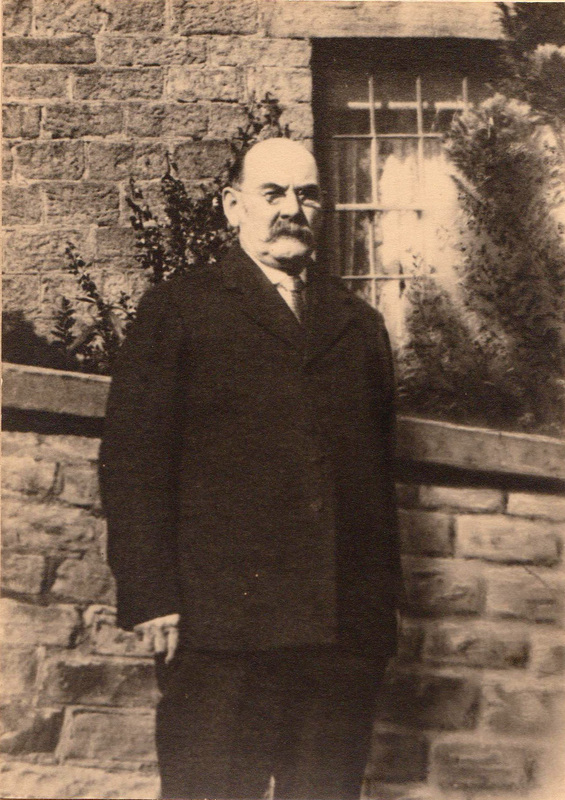 In 1880 he married Francis ‘Fanny’ Merinda Audley (1862 – 1942) from Newcastle-under-Lyme and they moved with Joseph’s job (Calico Printing company) to Bollington where he worked at Ingersley Vale Bleach works for A.J King. At first he lived in High Street with Fanny then Church Street and eventually settled for many decades in Rock Cottage on Beeston Mount where they raised their nine surviving children (two died young). Then sadly losing two sons, Gordon and Hedley, in WW1. 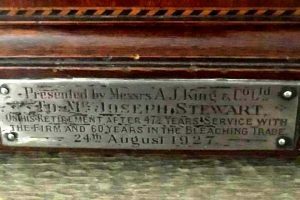 He was one of the founder members of the Bollington and Knutsford Conservative Party and was made an honorary life member. He was exceedingly well read and could talk on almost any subject. 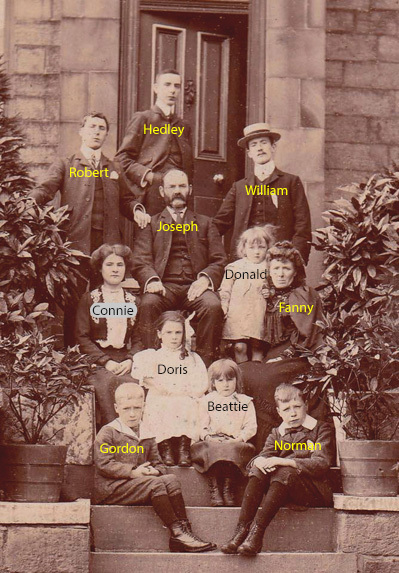 Here is a picture of the Stewart family, with Joseph at the centre, together with his wife Fanny, and their children Hedley, William, Robert, Donald, Connie, Doris, Beattie, Gordon and Norman, taken in about 1905. They are sitting on the steps of their home, Rock Cottage, on Beeston Mount. There are separate pages for Donald, Gordon and Hedley, and the other siblings. Joseph retired from Ingersley Bleachworks in 1927 at the age of 74 after 60 years in the company (48 of those spent at Ingersley). Here is his retirement letter. He was awarded an oak clock which his great grandaughter, Linda, still has today. 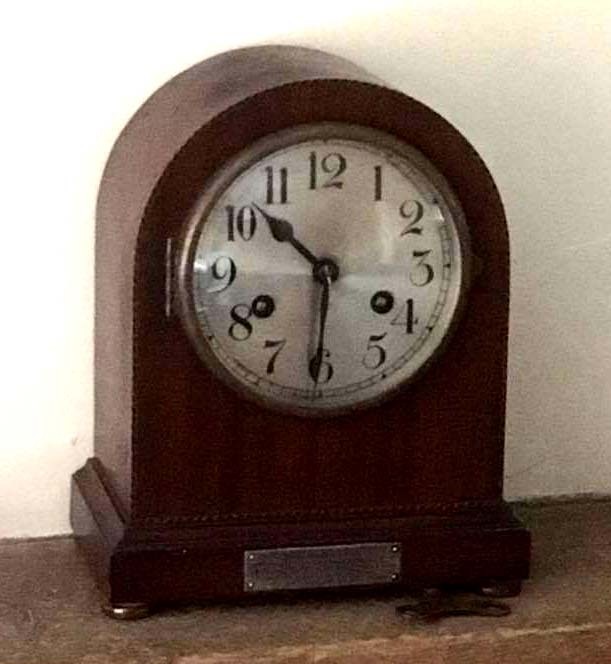 Pictured right is the inscription on the clock. 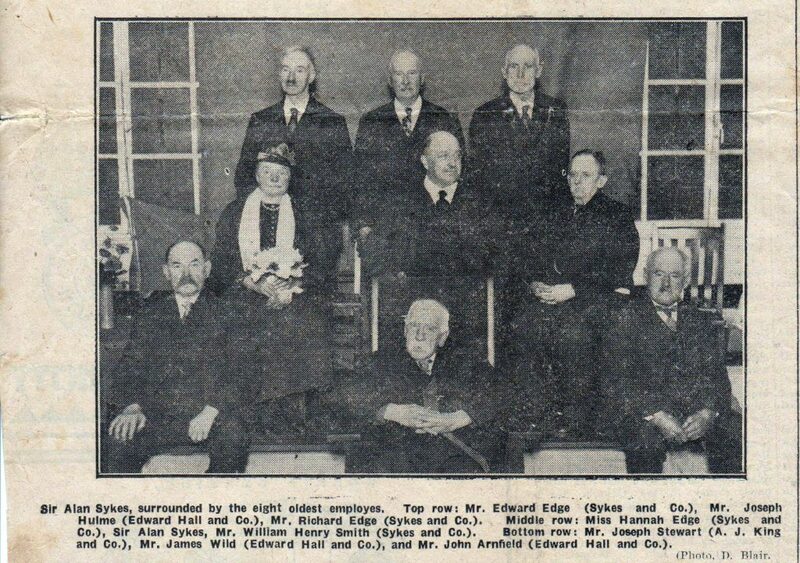 He was awarded long service recognition and thanks from the Bleachers Association around about 1928. He is photographed here (front left ) as one of the eight longest serving employees. 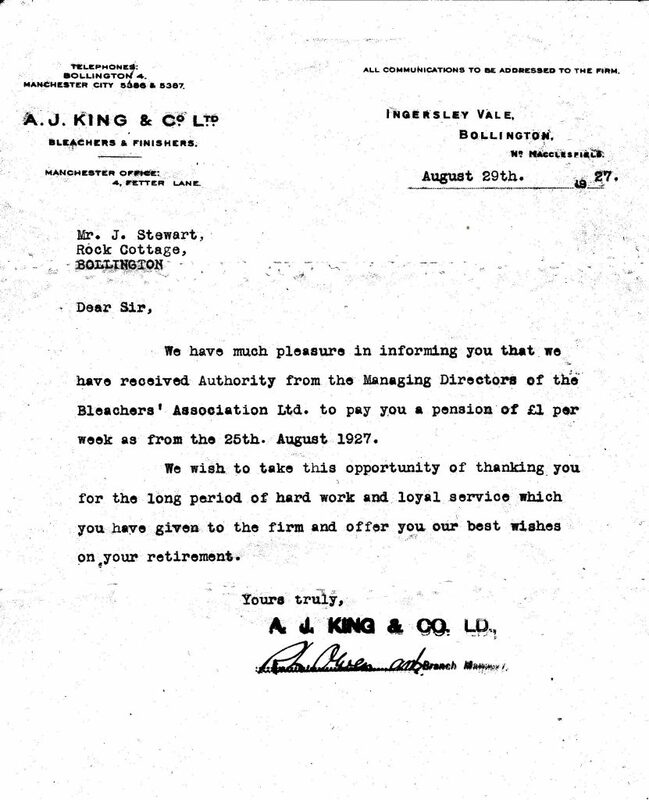 In the scan below, Joseph is listed as having served 60 years with the company. Joseph died in 1934 aged 81, his obituary (below left) describes his character and his achievements. Personal friends and family members described him as a gentle kind man according to his youngest son Donald. 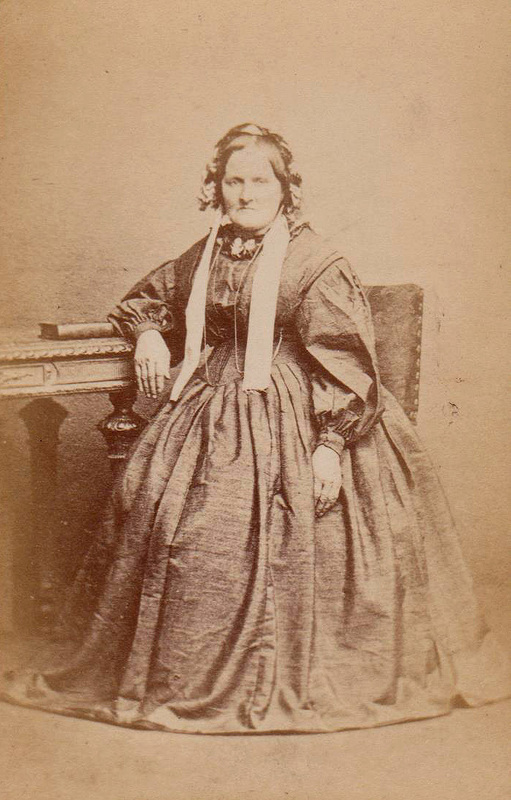 Fanny died 8 years later, in 1942, aged 80. Follow the family tree, start with Joseph Stewart. I am indebted to Linda Bester (nee Stewart) for this fascinating account of the Stewart family of Bollington.